Inspired by the interlocking of the most treasured relationships in life, the Treasured Sterling Silver, White & Blue Diamond Bracelet is a dainty and colourful addition to our bestselling Diamond Essentials collection. Three interlocked sterling silver rings sit delicately at the centre of an adjustable 19cm bracelet with two of the rings embellished with striking white and blue pave diamonds for a vibrant finish. 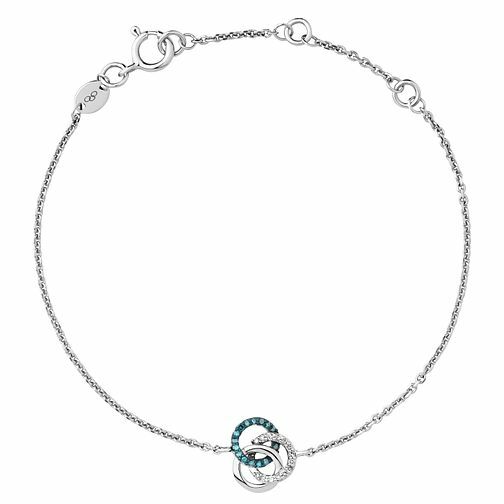 This dainty bracelet is perfect piece for those seeking a modern alternative to the classic diamond bracelet, adding a colourful and vibrant flourish to any look.